Summer on Hilton Head Island is an amazing time. We welcome and quickly hope to see our pine tree pollen leave so we can get on with warm temperatures and sunny days as beach season begins to kick in. Our foodie senses tell us it is time to enjoy light fare that is full of flavor and won’t cost us when it is time to take our first sun burn on the beach of the season. 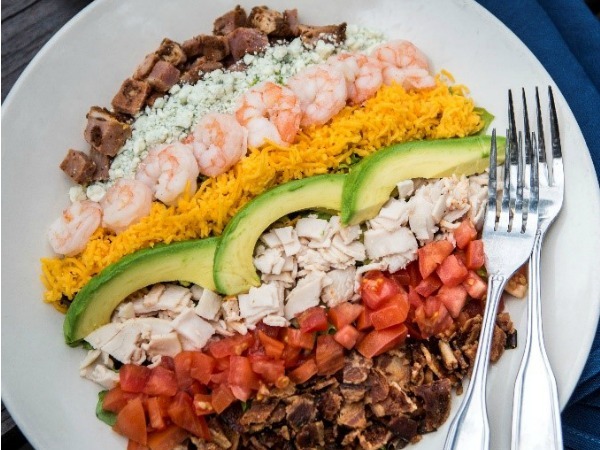 SERG Restaurants feature an unbelievable array of salads on every menu and below we’ll highlight the top 10 salads you have to try this spring at your favorite SERG Restaurant. The Poached Pear Salad features crisp pears over a bed of mixed field greens with dates and toasted walnuts. The Anson Mills Farro adds a healthy ancient grain from a wonderful local partner from the ACE Basin right here in the lowcountry. 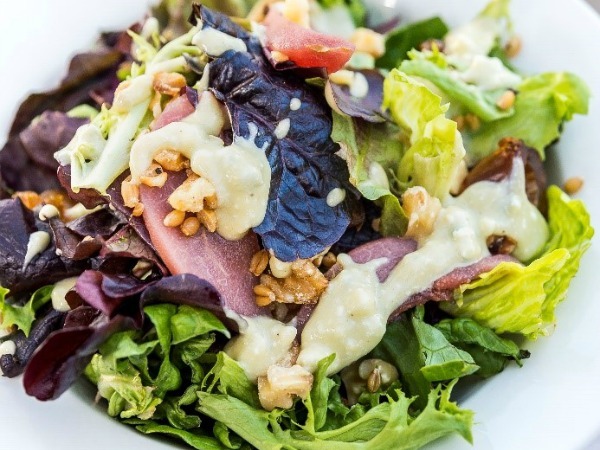 The salad is finished with a light bleu cheese vinaigrette and can be enjoyed during a lunch, dinner or Sunday brunch visit to Skull Creek Dockside. 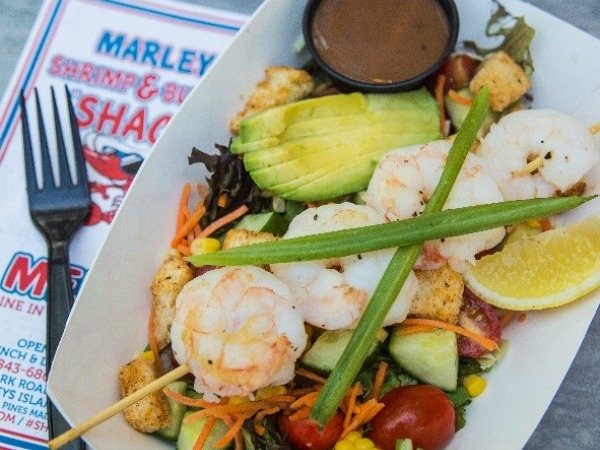 Marleys Shrimp & Burger Shack features a great light option with The Shack Salad which features avocado, carrot and cucumber over a bed of mixed greens and choice of dressing. The Shack Salad is a great pair with shrimp, chicken or cod and the special blackening seasoning at The Shack gives your spring salad just the kick of flavor you are looking for from a great salad. One Hot Mama’s does BBQ the best but the homemade honey cilantro lime vinaigrette is the star of this fresh salad option at Mama Orchid’s restaurant. The salad features a selection of crisp vegetables including kale, brussel sprouts, shredded carrots, red cabbage and diced cucumbers. Dried cranberries add the tender texture and toasted almonds and fresh crispy wontons give the salad a crisp crunch. 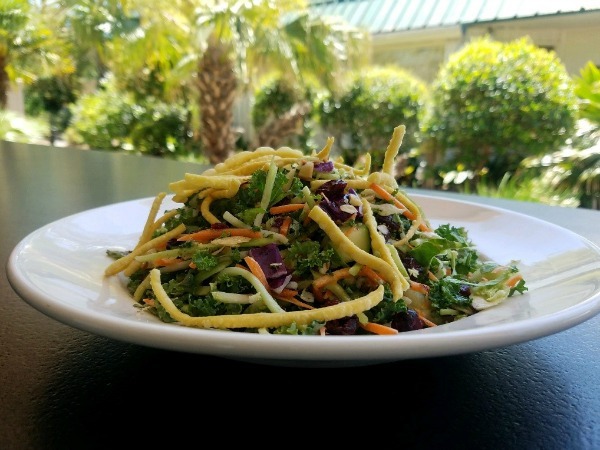 Frankie Bones has salads for days and is routinely awarded the Best Salad on Hilton Head, but you’ll have to keep reading for that specialty! The Roasted Beet Salad has fast become a legend with tender chilled roasted yellow and purple beets over a bed of mixed field greens. Thinly sliced Granny Smith apples add a sweet and sour crunch to the salad that is topped with hazelnuts, gorgonzola cheese and a light balsamic dressing. WiseGuys features the most outstanding signature house salad with their WG Salad. A sweet and savory treat over a bed of crisp romaine. The salad gets its sweet notes from candied pecans and sun-dried cranberries and the savory from crumbled gorgonzola cheese and a creamy balsamic vinaigrette. Thinly sliced Fuji apples add a crisp texture to this signature salad. Poseidon features great fresh salad options and the Baja Salad narrowly edged out the Maine Salad for its place on the top 10. 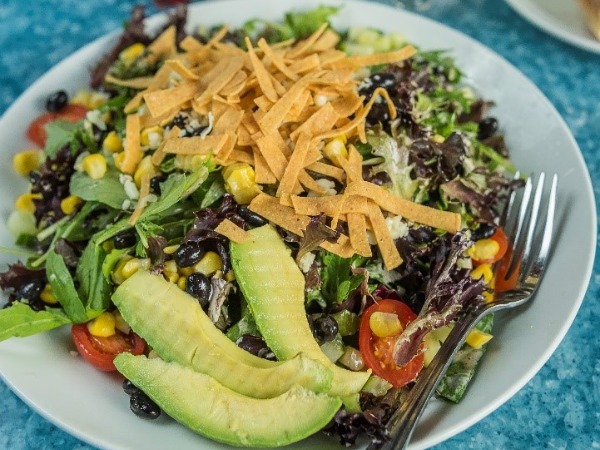 The Baja Salad features a mix of roasted corn, black beans, diced cucumber and grape tomatoes over a bed of mixed field greens. Fresh avocado slices add a creamy texture to the salad along with shredded Monterey Jack Cheese. Thinly sliced crispy tortillas add a crunch to the salad and the red chili ranch dressing offers a bit of kick to this delicious option. Blackened chicken makes a wonderful addition to this top ten selection. 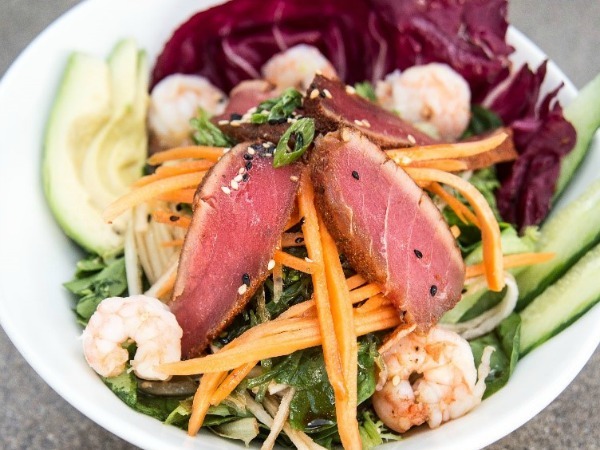 The Black Marlin Bayside Grill is home to an island legend with their Sushi Bowl Salad. The mixed green based is topped with fresh daikon radish, julienned carrot, seaweed, diced cucumber, avocado and shaved onion. The sushi element is added with fresh tuna tataki and shrimp along with jasmine rice. A bit of wasabi rounds the salad out and it is finished with a homemade soy vinaigrette. You won’t find a salad with more mojo on Hilton Head than the Seared Ahi Tuna Salad at Marleys Island Grille. 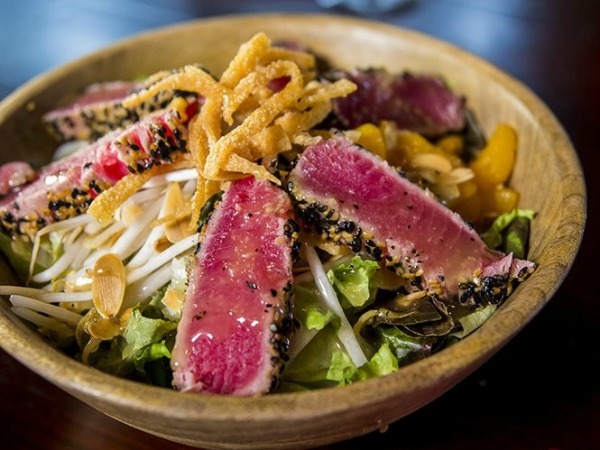 Thinly sliced rare seared ahi tuna over fresh greens is accompanied by mandarin oranges and a rainbow of crunch with water chestnuts, toasted almonds, bean sprouts and crispy wontons. The homemade sesame ginger dressing gives the salad a fresh kick and leaves you with a satisfied salad experience. 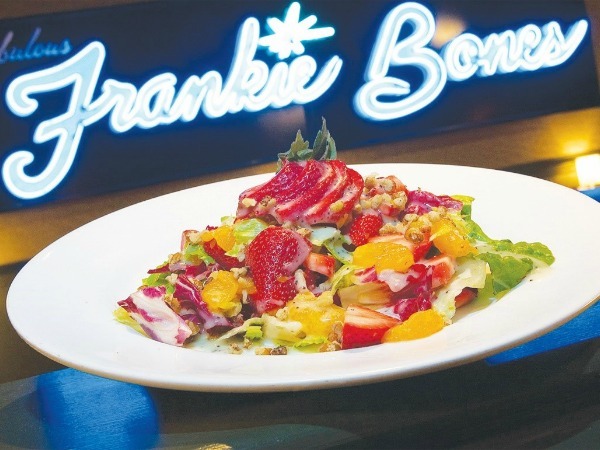 Routinely voted the Best Salad on Hilton Head by locals and visitors, Frankie Bones has been preparing the Strawberry Walnut Salad for over 13 years. The salad is simple yet satisfying with fresh sliced strawberries and mandarin oranges over a bed of mixed field greens. Thinly sliced red onion and a bounty of crisp walnuts combine with the signature honey poppyseed dressing to round out this island favorite. The salad pairs perfectly with a fillet of grilled Atlantic salmon and is available for lunch, dinner or Sunday brunch.